Mt. Fuji from Mikasa Pass. Photo by hogeasdf. 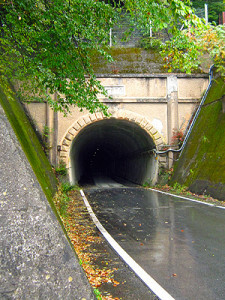 Mikasa-toge Pass is a mountain pass across towns of FujikawaguchikoW and FuefukiW with an old tunnel which was opened to traffic in 1931. Until the opening of the tunnel, people had to walk across the pass through the mountains on foot which was a tough route but has been charming people by the view it provides. 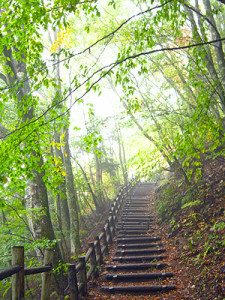 The brilliant view from this mountain pass was recognized from the ancient times. It was said that the legendary prince, counted as one of the gods in ShintoismW, Yamato TakeruW, passed through this Pass on expedition of the Eastern lands and this Pass has the detail view to become mythology! The view from this Pass has inspired many artists from past to present. You can see the astonishing photo used on top by hogeasdf, a great photographer of Mt. Fuji and other beautiful landscapes, which in the past, the world-famous UkiyoeW artist, Katsushika HokusaiW sent great works showing an inverted image of Mt.Fuji reflected on the water, in “Koshu Misaka Suimen (meaning ‘surface of Lake kawaguchi　looking over from Misaka-toger Pass, Koshu Pref.’) and Utagawa HiroshigeW’s “Kai Misaka-toge”. 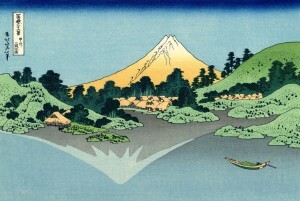 ‘Koshu Misaka Suimen’ by Katsuhika Hokusai. 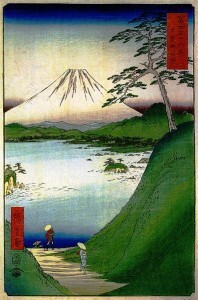 “Kai Misaka-toge” by Utagawa Hiroshige. To get to Misaka-toge Pass, don’t enter the new tunnel on National route 137 but take Yamanashi Prefectural Road 708 before either sides of the new tunnel. Road 708 is narrow mountainous road with many sharp curves so be careful with your driving. 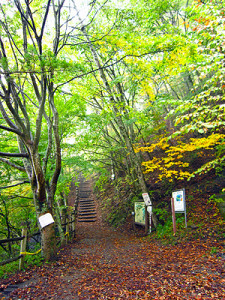 The Pass is an entrance also for climbing Mount Misaka which will entertain you with super views of Mt. 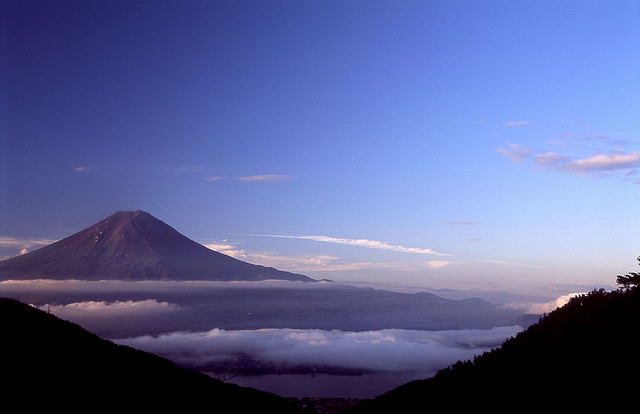 Fuji and great nature. If you are climbing or trekking around this area, make sure to have the right equipment with you. Wild bears also exist here so be sure you have the ‘bear avoiding bells’ and right information beforehand from the local mountaineer on the dealings of wild bears. 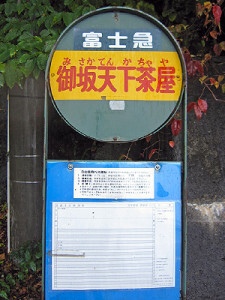 You can also take Fujikyu Yamanashi Bus from Kawaguchi-ko station up to this Pass.